LAKEWOOD – WRFA’s biggest fundraiser of the year is happening Tuesday, June 27 in Lakewood! 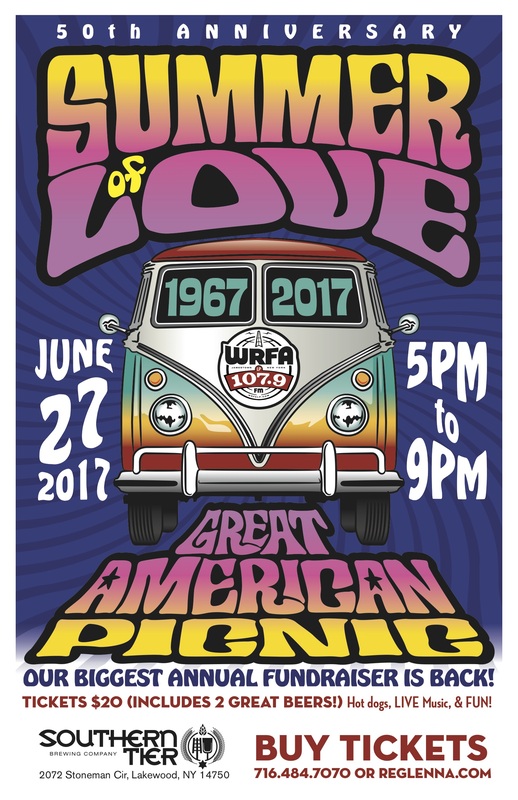 The sixth annual WRFA Great American Picnic is set to take place at Southern Tier Brewing Co., celebrating the 50th Anniversary of The Summer of Love! The event will feature over three hours of live music running from 5 to 9 p.m. The performances will also be recorded and broadcast on WRFA in the coming weeks. The cost to attend is $20 and includes two courtesy beers from Southern Tier. Anyone under 21 is admitted free of charge. All proceeds will benefit WRFA. Tickets can be purchased ahead of time online, at the Reg Lenna Center for the Arts box office, or at the brewery the day of the event.